You can take it with you: the best jewelry travel cases. 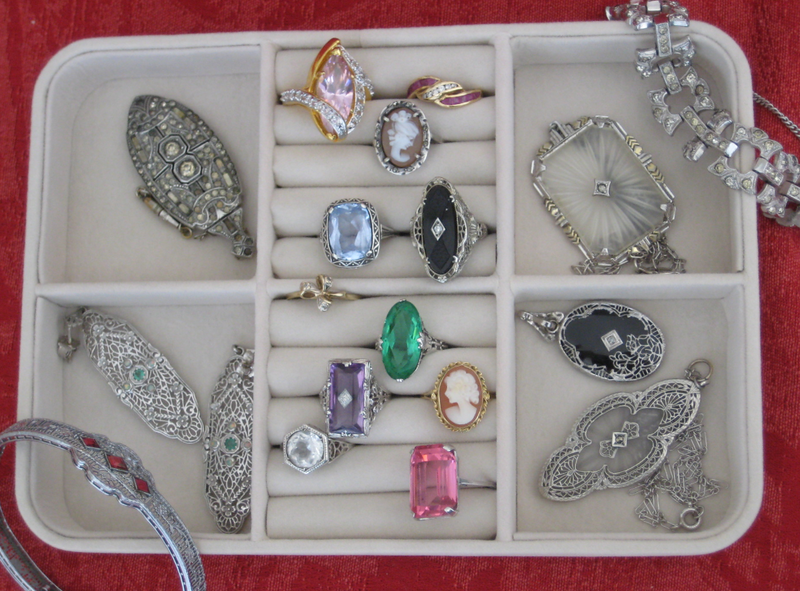 You are here: Home / Jewelry / Guides and tips / You can take it with you: jewelry travel cases. 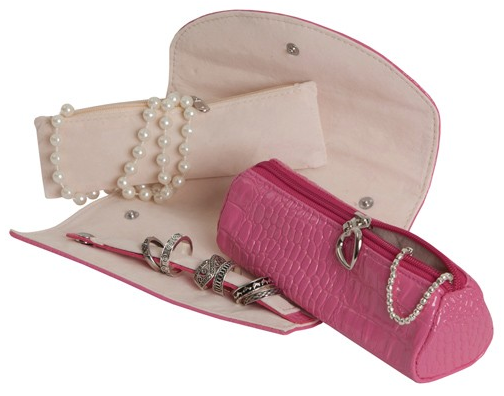 You can take it with you: jewelry travel cases. Traveling with jewelery is easier said than done. Necklaces get tangled, rings can fall off, bangles can be bent. But a vacation without bling is no vacation at all. What’s a lady to do? Up until now, I’d been using a makeshift system of little boxes (the cardboard ones like you get for jewelry at a department store) and drawstring bags to keep everything safe and separate. This was moderately successful, but not elegant. 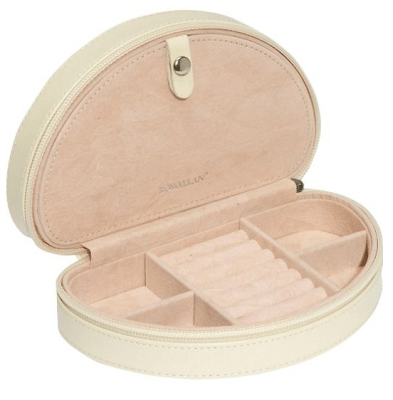 My quest for the perfect jewelry travel case has taken many months, but I’ve found one. I’d like you to meet the Alice jewelry keep by Rowallan. (Mine is pink, obviously.) It’s lovely – sleek and leather. It’s not too big, so I could easily stick it in my carry-on for traveling. 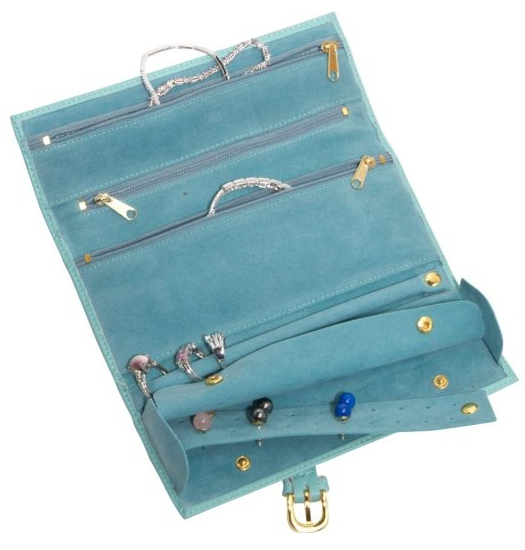 The inside is suede has has plenty of ring rolls – which are also great for holding stud earrings – as well as compartments for larger earrings. The snapped flap on top flips down to reveal a split compartment for necklaces with a snap tab to hold chains and keep them from tangling. I’ve taken it on one long weekend away so far and it worked great. I could unzip it and see all of my jewelry at once, which is exactly what I wanted. It didn’t fit my largest statement necklace very well, but that’s fine. It’s main purpose is to keep track of smaller pieces, anyway. First, a note about security: I think the best rule when traveling with jewelry is to assume that it might get stolen. If you can’t live without something, leave it at home, talk to your hotel about a safe, or keep it on at all times. When I travel I tend to stick to costume jewelry, or bring one pair of diamond studs and wear them every day. My favorite way to shop is to buy a lot of options and then return all of the options but one. Here are mini-reviews of the cases I checked out that were nice, but not right for me. This is the Mele & Co Giana Plush Fabric Jewelry Box. It’s beautiful, and stunningly high-quality for the price. It has ring rolls, side compartments, a lift-out tray, a mirror – it’s great. I liked it so much that I saved it to give to my sister as a Christmas gift (she loves it). Its only flaw as a jewelry travel case is that it’s bigger than I wanted (7 3/8″ x 5 1/2″ x 2 3/8″). As you can see in my photo above, this baby holds enough sparkle for a glamorous fortnight in Paris, and I was looking for a bling keeper more appropriate for a long weekend in Virginia wine country (sigh). 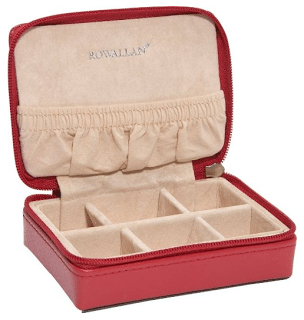 If you liked my jewelry travel case but want something smaller, the Rowallan Rowan Travel Jewelry Keep is the case for you. At 2.5″ x 6″ x 1.7″, it would fit easily into most handbags. Under the removable suede layer that’s blocking most of the view in this photo, there’s a small section of ring rolls (about 1/3 of the space) and an open compartment. 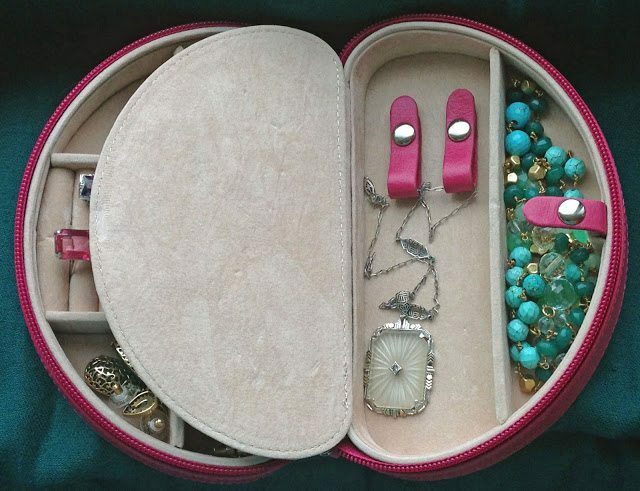 What’s great about this one is that the top compartment has the little clip to hold your necklace chains as well as the elasticized pouch below to hold the pendants. I was pretty sure I didn’t want a traditional jewelry roll, but if I had gone for one it would have been this Amerileather one. It’s beautiful – soft leather lined in suede and obviously high quality construction. It has ring storage as well as a specialized component for stud earrings, which I thought was great. It also fit well in my purse, since it folds up flat. I also enjoyed the color selections – a Tiffany blue jewelry roll is hard to beat. 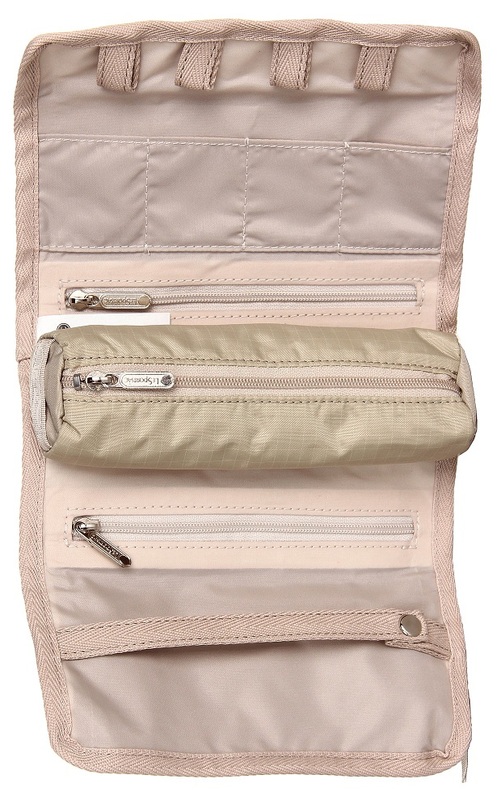 This is the Mele & Co Jenna travel jewelry roll. If you want a small and basic way to transport a little bit of jewelry, it’s perfect. I love that it has a ring element and multiple compartments – rare in simple rolls. This one was too small for me (and I personally didn’t like the fake crocodile print and heart-shaped zipper pull) but it’s great for what it is. The adorable Rowallian Reece Mini Travel box. At 2.75″ x 4″ x 1.25″ it would fit in anything but can’t hold much but rings and stud earrings. Could it be cuter? I really wanted to keep this little guy, but it just didn’t work for my jewelry travel case needs. 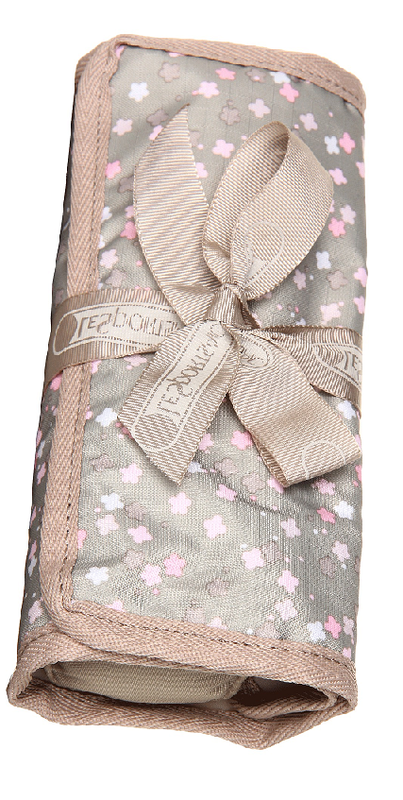 And last but not least, the LeSportsac Ruby Roll. 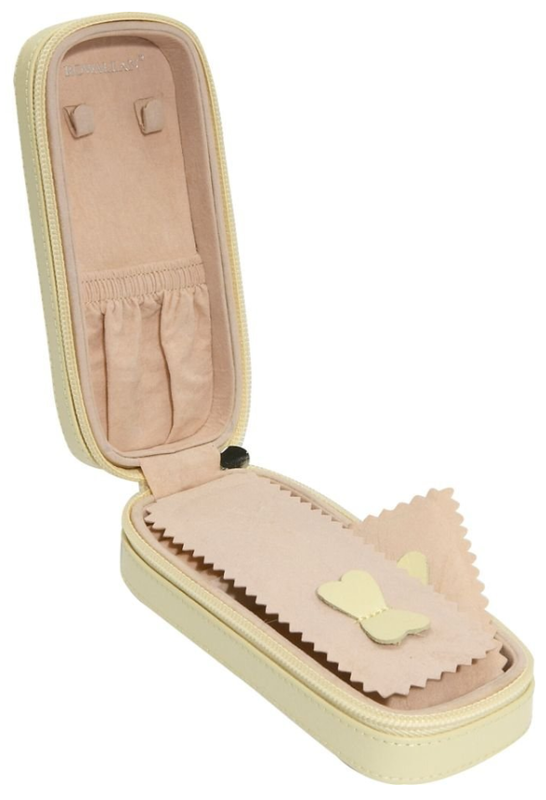 This is a less frou-frou option than most of the other jewelry travel cases (part of why I didn’t pick it…you know me). But it’s fabulous: roomy compartments, smart design, good size. I wanted something with some substance to it, but the squishibility of this one makes it easier to pack. The “speckles” print is pretty cute. You can see a video demonstration of the Ruby roll on Zappos. 6pm.com has the best price, but only for certain colors. That’s all I’ve got for you, my dears. What do you think of the options? How do you travel with your jewelry?